The ugliest building you’ll ever see on this site! Five buildings that could be movies. The painting is being made into a movie. and he blogged about it on his fine site. Tyler also links to others who chose five. 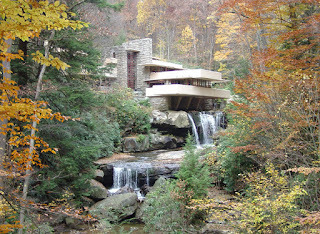 One on my list would be by Frank Lloyd Wright (his work is very cinematic), Fallingwater? Unity Temple? How about you, which would you cite? 1. Phyllis Lambert told me this. Tyler makes me think. 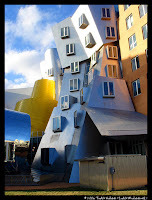 He asks, “What are our five favorite buildings in America, that are publicly accessible? “ The list was not easy to make. We are blessed with great buildings in this land. From California, to the New York Island. But we’ll give it a try. All this was prompted by this crazy AIA list of “the people’s” favorite buildings in America. So here’s ours, in reverse order of favorites. #5. “Cloud Gate” in Millennium Park, Chicago, by Anish Kapoor. Tyler says the arch is the best piece of public art in America. He might be right, it is sublime and thoughtful and delightfully modernist. But is it superior to the Vietnam Veterans Memorial in D.C., the Statue of Liberty, or “the bean?” “The bean,” Cloud Gate, is also a gate, not seen in the pic above, and as I’ve written, it expresses Einsteinian space, the relationship of the individual to the collective, of the individual to the self, the relationship of heaven to earth and light to solid, and it gorgeously displays the celestial passage of time. Not bad for a single object. 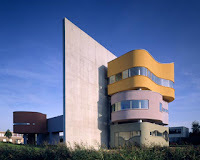 I’ll vote for it as a “favorite building” also to show how architecture and sculpture are wedded these days. 4. Fallingwater and Robie House, by Frank Lloyd Wright. Robie House better and for its urban location and size it would be an easier model for more people to follow. Would that urban and suburban dwellings were built with such sensitivity and artistry today. 3. The Auditorium Building, by Louis Sullivan. A powerful, beautiful statement of the importance of bringing culture at the highest levels to all the people. A gesamtkunstwerk by “unser Lieber Meister,” if ever there was one. In there more than anywhere else in the world, one feels, “Ars Longis, Vita Brevis.” And it’s thrilling. When the performance is moving, say, the Joffrey dancing Balanchine’s “Apollo”, one looks up at the space under the golden, electrically lit arches above, and has a taste of what heaven will be like. 2. 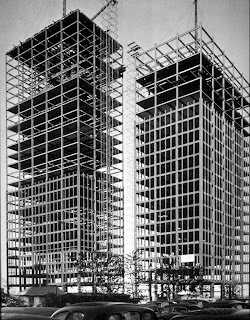 860 – 880 Lake Shore Drive Apartments, by Ludwig Mies van der Rohe. Mies’ work was left off the AIA/people’s list of favorite buildings, but his solutions to find dignity and poetry in modern, industrial life are unrivalled. I always live in large cities, and can only afford to live in a high-rise. If I could live in any high-rise anywhere, I’d like to live in 860 – 880 N. Lake Shore Drive in Chicago. Oh, wait a minute, I do live there. I’ve been there 5 years. Each day is magic. The ways the two halves of the whole play off of each other, in unfolding overlapping ever-sliding planes. The way the I-beams rise up the sides, create depth and when you walk around the buildings, cause the facades to seem to open and close. The crystalline cleansing of walking through the lobby. The serenity of looking out through my magic windows, through which the city takes on a perfection. After 5 years, I still hear music from these works of art. 1. 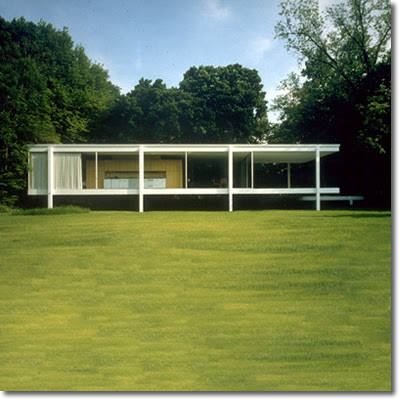 The Farnsworth House, by Mies. Plato would be jealous. The Farnsworth incarnates, in space, light and a few fine materials, mostly in pure white, the perfect idea of the modern house. Whether it works well or not is another issue. I love to sit inside and contemplate the ever-changing nature outside, and the nature of life, lived in a modern way – is that possible? – inside. Space and time flow through one, inside this lantern, this beacon, this jewel in the woods. It is more beautiful, more shocking, more perfect than you, or even Plato, could imagine. A true Temple of Love to love. Adding to it’s allure is that it’s unattainable now that it’s owned by the National Trust and Landmarks Illinois. When it was for sale recently was the only time I’ve ever played the lottery. I thought of mine off the top of my head, I’m sure I’ll argue with myself as soon as I post this. What didn’t make my list, but could have? For a religious building – Eero Saarinen’s chapel at MIT. For a library – Louis Kahn at Phillips Exeter Academy. Now let’s build more good ones! 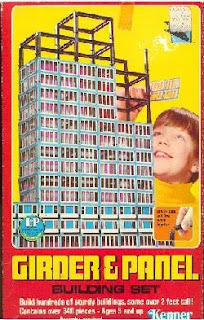 Architecture presents for the kids. Careful what you get ’em! 860 – 880 by Mies. You are currently browsing the archives for the Fallingwater category.